Yvonne Braithwaite Burke, an only child, was born on October 5, 1932 to James A. Watson and Lola Moore Watson. She grew up in Los Angeles, where her father worked as a janitor for MGM studios. While there, he organized the janitors into the service employees union. Her mother was an elementary school teacher, and later became a stockbroker. The couple met when her father -- who played baseball on an all-black team for a city in Texas -- traveled to her mother's home town to play. They became acquainted at a reception following the game, and dated for six years before marrying. The neighborhood in which Burke grew up was close to commercial areas in downtown Los Angeles. It was multiethnic, with Chinese, Japanese and Mexican Americans in the neighborhood, as well as African Americans. Racial covenants were in force at the time, which effectively kept minorities from moving into predominantly white neighborhoods. Because of the de facto segregation, African Americans of all economic strata lived not far from each other. A “straight A” student throughout her academic career, Burke was transferred in the fourth grade into a teacher training “lab” school at the University of California where she could take advantage of the better curriculum there. She decided at age 15 that she eventually wanted to go to law school. In 1949, after graduating high school, she traveled north to Berkeley to attend the University of California at Berkeley. She also was a member of the Alpha Kappa Alpha Sorority. In her junior year she transferred back down to Los Angeles to attend the University of California at Los Angeles, and earned her undergraduate degree from the institution. By moving back in with her parents, she was able to save money to attend law school. In 1956 Burke graduated in the top third of her class to earn her juris doctorate from the University of Southern California Law School. While attending USC, she and two Jewish students were refused membership in the women's law society and so launched their own rival group. Burke shone early in her career as a defender of public interest. In 1965, after the infamous and wildly destructive Watts riots in Los Angeles, she played a key role in organizing the legal defense for those charged in the riots. Soon after, she was named by the governor to the McCone Commission, which was charged with determining the cause of the riots. 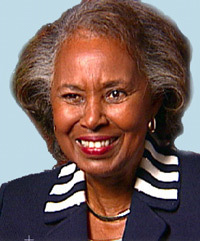 Burke's political career began in earnest in 1966 with her first "first"--her election as the first African American assemblywoman in California. She served three two-year terms in the California legislature as representative of the state's 63rd Assembly District. It was during this time that she met her husband, William Burke. Among the causes she championed during these years were prison reform, child care, education, and equal opportunities for minorities and women. When the state legislature proved too unresponsive to Burke's change-minded ways, she set her sights on a seat in the U.S. Congress. Her winning Congressional bid made her the first African American woman elected to Congress from California, or any other state in the American West. She was chosen vice chair of the 1972 Democratic National Convention, another first for African Americans, and remained in Washington D.C. for one six-year term, from 1972 to 1978. "I came along at a time when there was a demand to give men greater visibility and opportunity," Burke is quoted as saying in the Columbia Book of Quotations. "In white society they were saying, 'Women can't do it.' In black society, they were saying, 'Women do too much.' It's a diabolical situation." While in Congress, Burke also became the first member of Congress to give birth while in office, and therefore the first representative to be granted maternity leave. Autumn, her daughter with husband William A. Burke, a Los Angeles businessman, was born in 1973. She also has a stepdaughter, Christine Burke. After leaving the nation’s capital, she became the first African American member of the Los Angeles County Board of Supervisors. After just one year, however, she was not re-elected to her position, which was the first failure in what had been for Burke an unblemished political career. For more than a decade, her position in American politics had risen steadily. She also lost a bid for the California Attorney General's office, which was another setback. After failing to win an elected office in 1980, she joined the law firm of Jones, Day, Reavis, & Pogue, where she practiced law for a decade. During this time, she remained a champion for various issues in Los Angeles. She was effective as chair of the Metropolitan Transportation Authority (MTA) board of directors and a member of the Alameda Corridor Transportation Authority. She also is a member of the L.A. Coliseum Commission, the Local Agency Formation Commission (LAFCO), and is a fellow of the National Academy of Public Administration. She was chair of the L.A. Federal Reserve Bank, and was vice chair of the 1984 U.S. Olympics Organizing Committee. She has sat on boards of numerous organizations and corporations, including Nestle. Burke regained a seat on the Los Angeles County Board of Supervisors in 1992, and has remained on the board since. She was chair of the board in 1993-94, 1997-98, and 2003-04. As a member of the Board of Supervisors, she has focused on the needs and education of children, especially those who must be cared for in the County's foster child programs. She has been a prime mover in bringing about the Department of Children and Family Services new Family to Family program, promoting the placement of foster children in homes near their original neighborhoods. She has also established numerous child care centers that in addition to supervision also provide learning enrichment programs and nutritious meals. Burke ran unopposed for the supervisor's seat in 2000, and so used her campaign funds to establish the Second District Education and Policy Foundation. The group provided $180,000 in scholarships to students in Los Angeles' Second District by 2003. Time magazine once selected her as one of "America's 200 Future Leaders," and she was named as Woman of the Year by the Los Angeles Times.